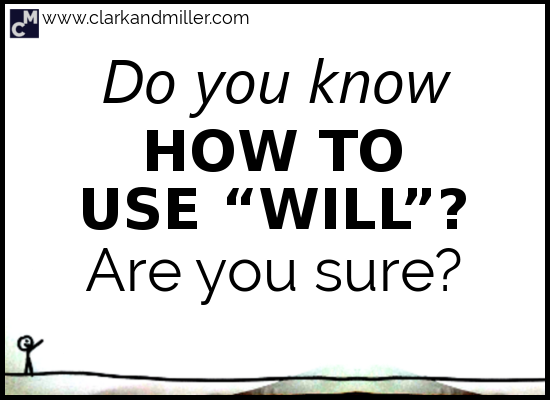 Today you’re going to learn how to use “will” in 4 ways that you probably haven’t thought of before. Want to talk about the future? Click here. And that answer is kind of right. Kind of. The shirt thing is, of course, completely correct — you wear great shirts. Everyone knows it. But the “‘will’ means future” statement? That’s less true. And that’s all fine. The grammar, I mean. The fact I’m going to be replaced by a robot? Less fine. But the word “will” is often used in other, completely different ways — most of them don’t have that “future” feeling at all. This is actually quite a common phrase: “He’ll do that” or “They’ll do that” or “She’ll do that,” etc. But why “will”? This isn’t about the future! Exactly. This is a use of “will” that a lot of course books don’t talk about — we frequently use “will” to describe general habits. Again, this isn’t just a plan that the flying mouse has made with her husband. No, this is something that the flying mouse does every year — as a matter of habit. Isn’t this when we use the present simple? Well, yes — we can. But be careful! This isn’t a complete replacement for the present simple. That’s because we can’t use “will” to describe states — just habits. You can’t say “This massive spider will be green” (unless you’re talking about the future, and, for some mad reason, the spider is going to change colour. Wow — spiders are weird.). “Will” for habits becomes the “would” for past habits. Again, be careful here! We can’t use this for states. I’d prefer it if neither of these sentences were true — I mean, who likes Enya? This is quite a special use of “will” (well, actually “would”). As you might know, when we use the phrase “I wish …” (or “if only…”), we usually “push” the grammar to the past. This should be “I wish the sun was coming out,” right? In fact, I’d say that it’s even a little more natural (for me, at least). Good question. I like your questions — they’re always good ones. The answer is that with “I wish” (or “if only”), we can use “would” when the subject of the sentence changes its behaviour somehow. This “would” isn’t “futurey.” My theory is that it’s more like the German “will,” (pronounced “vill” — because German) meaning “want.” It’s about having control and making a decision to do something (or stop doing something). “I wish the building wouldn’t be so tall.” — That just sounds weird. “I wish your hair wouldn’t be so curly.” — Also weird. On many levels. You’ve planned a dinner party, and you’ve invited five friends. One of your friends, let’s call her Jee because that’s quite a nice name, is a little eccentric. Unlike most of your friends, who always arrive on time or a few minutes late, Jee always arrives one hour early. Exactly one hour early. No one knows why. She just does. So you’re getting ready for the party. It’s an hour before you told everyone to arrive. It’s obvious what’s happened, right? It’s Jee — Jee’s arrived an hour early. Like she always does. Why not “That must be Jee” or “That could be Jee”? It shows that you’re sure it’s Jee. It also shows that you’re sure it’s Jee because you’ve somehow calculated it. We use it when we want to show that we’ve figured something out. It’s also very common to use this in the continuous when we’re talking about time. Let’s say Jee has been visiting some old friends who now live in Darwin in northern Australia. They’ve had an awesome time together, but all good things must come to an end, and Jee has to get a flight back home. Her friends drive her to the airport. Then drive back home again. A few hours later, they’re talking about what a great time they had with Jee. “I wonder what she’s doing now,” one of them asks. They look at the clock. So you can use this form when you know what someone’s doing according to some sort of schedule. So there we go. “Will” is weird, isn’t it? When was the last time you could’ve used the phrase “He’ll do that” or “She’ll do that,” etc.? When did you use it? Who was it about? What was he or she doing? Did you find this useful? Do you know any people (or anteaters) that might also benefit from this? Then BE AWESOME AND SHARE! Spread the knowledge! Good post. I like your posts — they’re always good ones. Ive just discovered your website. You guys are a ‘crack up’. Its great and very very helpful. *-* thanks a lot! The only one is hard to understand for me is #4 :(. … btw isn’t it “I wish I WERE thin” in the example in # 3? Yes. That one is a bit tricky. But try to use it in “real life” conversation, and you’ll get the hang of it! Thanks a lot for another great lesson! I seriously love all your posts. Do you mean we use “would” to say that we “want” the subject of the sentence somehow in some way changes its behaviour, although that’s something we have no control over, so we wish(want) that could happen? Is there any difference in the degree of certainty between “I’ll be visiting Iceland” & “I’m visiting Iceland”, with a plane ticket booked? I work as a private tutor. I used not to receive advance tuition fee, but I’ve learnt the lesson that it’s necessary to ask students for advance payments and to follow the class cancellation rules. I’ve never bothered by the short-notice class cancellation since then. Now, every time when a student cancels just before the class, the thought, “I’ll be really pissed off right now if I didn’t enforce the rules to them. But now, I’ll be doing my studies. Yeah!”, pops out. So I’m actually happy about having extra personal time without losing income. It’s the first time ever that Iceland attends the FIFA World Cup 2018. From the recent COCACOLA Iceland commercial about the Icelandic football team, I’m sure the team will be going for every game they play. Though I’’ve never gone in for football, I’ll be holding tight for the Iceland VS Argentina match tomorrow. As Argentina is such a formidable opponent to the Vikings, I’m super excited yet nervous about this particular one. And no doubts that Argentina will be going for the whole event. In answer to your first question: Yes — we use “would” instead of “will” after “wish.” As you can see in the post elsewhere, we use “will” do describe behaviour. But when it’s with “I wish it wouldn’t …” it’s usually something we can’t control. As for the example…. where’s the “I’ll be V-ing”? There’s a “I’ll be V3” (“I’ll be really pissed off”)… is that what you mean? For both questions 1 & 2, your answers are clearly understood here and in the other post. Thank you! Did i put them correctly? GABRIEL, would you be so kind to help me out with this doubt of mine? It regards the use of “will you” at the end of sentences. Could you please provide some sentences? Does it sound polite or rude? Thanks! We use “will you” as a question tag when we’re asking people do something for us. But it’s not too polite. If you use it with your friends and family, it can feel familiar and close, but if you use it with someone you don’t know too well, it can sound a bit aggressive.